The Index opened weak below 8500 and huge sell-off, a cascading effect which saw one Option support failing after another, to the lows of the day at 8325.35 just to close a few points above at 8342.15, a huge loss of 188.65 points. The broader market was also very weak, with just 454 advances to 1057 declines. Developing Range as per Option Table at start of series is 8200-9000. Call option 8000-9200 added huge 65.53 lacs OI. Put option 9000-8000 added huge 45.76 lacs OI. 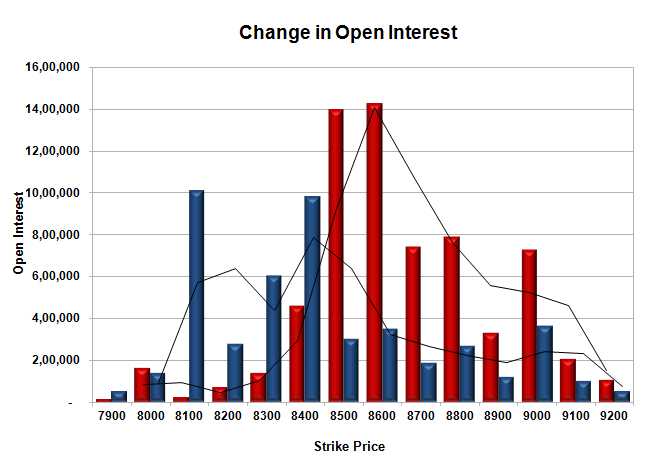 Nifty Open Interest is at 2,18,37,850 up by 72,98,200, with decrease in price, 100% roll-over with huge short build-up. Bank Nifty Open Interest is at 21,62,875 up by 7,88,075, with decrease in price, 100% rollover with short build-up. FII’s sold huge 17.63 lacs Futures, which includes 211448 contracts long liquidation and 38993 contracts short covering, with decrease in net OI by 250441 contracts (includes 209118 longs to 279655 shorts for the day) and the Average Price comes to 8579.20. FII’s Index future open contract as on date is 515143 Longs to 146135 Shorts, net long 369008 down by huge 172455 contracts. Initial support at 8300, with OI of 23.43 lacs and below that at 8200 with OI of 23.77 lacs. 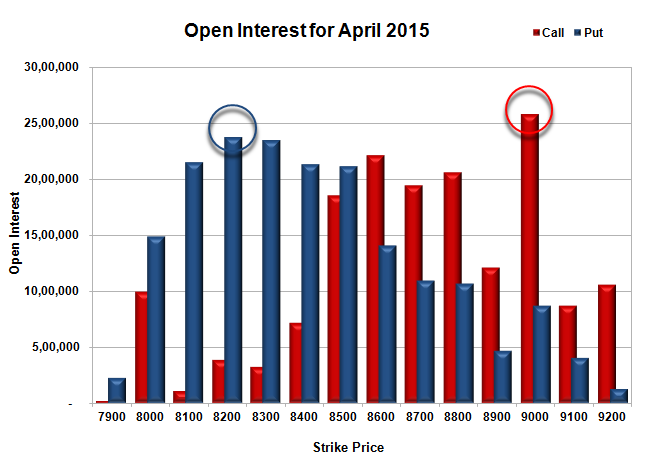 Initial resistance at 8500, with huge OI addition of 13.95 lacs and above that at 8600 with OI of 22.11 lacs. 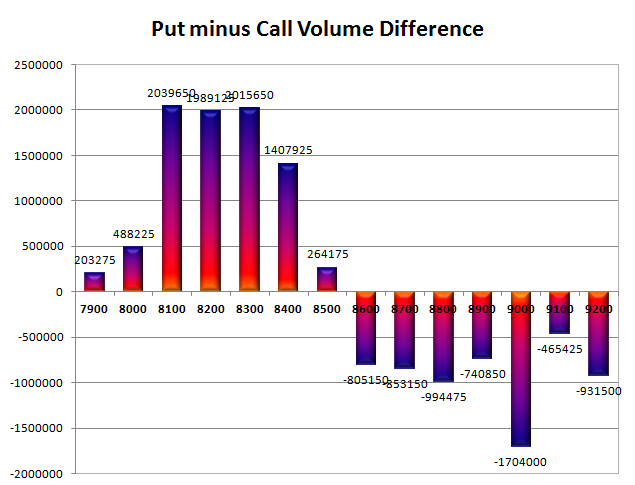 Day Range as per Option Table is 8295 - 8463 and as per VIX is 8276 - 8408 with 8389 as the Pivot.